Samsung Electronics today introduced its latest heat dissipation packaging technology solution for display driver ICs (DDIs) in high-end TV applications. Samsung's new ultra Low Temperature Chip On Film (u-LTCOF) packaging solution enhances heat dissipation in high-performance, high resolution TVs by minimizing the contact thermal resistance between the DDI package and the display panel chassis. 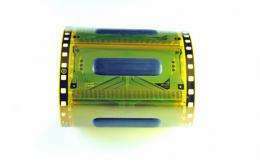 First introduced in 2007, Samsung’s Low Temperature Chip On Film (LTCOF) used a thin-film metal tape to effectively spread heat generated from the DDI to provide a 30 percent improvement in heat emission over conventional chip on film (COF) packages. Samsung’s new u-LTCOF replaces the thin metal film with viscoelastic silicone that has a high thermal conductivity to enhance heat transfer characteristics by more than 20 percent against the LTCOF package. Additionally, this new solution can deliver cost competitiveness to display panel manufactures as the package coated with viscoelastic silicone does not require the addition of thin metal film or thermal pads. Samsung’s new u-LTCOF package is designed for display driver ICs used in 240Hz Full HD and 3D LED TVs as well as 60/120Hz mid to large-sized LCD and PDP TVs to significantly and effectively improve the heat dissipation needs of these high-performance, advanced-featured TVs. Samsung has finalized reliability tests on the u-LTCOF package and plans to start production of the new package solution for its DDI devices from the fourth quarter of 2010. AC Electricity Generation and Transmission over a Single Wire?